Connect up to 2 mobile phones via Bluetooth technology, to help avoid mobile signal drop outs as you walk around the house, all from the comfort of your BT Halo. The BT Halo features the top of the range Premium Call Blocking technology. 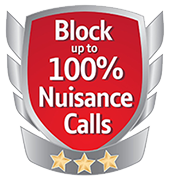 This amazing technology offers users complete control over which calls they want to take and those they wish to block. You can block up to 1000 individual numbers, or block calls by their type, such as witheld, international or even payphones. So long as you add your contacts to your phone, they can bypass the call blocking, so you don't miss them all important calls from friends or relatives. The BT Halo syncs and stores up to 2,000 of your mobile contacts onto your halo phone, so you always have your contacts to hand.